Once in a while a request comes up for information on how to lubricate control cables. You need a foot and a half of 3/8 ID reinforced plastic hose from Lowes, a tire valve, three hose clamps, a tire pump or small 12 volt air compressor with a gage, and MMO. Shave the tire valve down and clamp it in one end of the hose. 1. Remove the fittings from one end of the cable. 2. 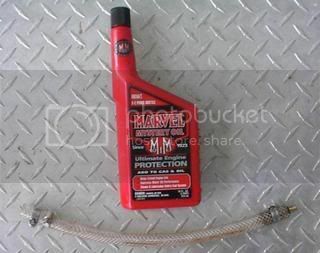 Put 3 inches of Marvel Mystery Oil in the hose for every 20 feet of cable length. 3. Double clamp oil filled hose over cable. 4. Apply and maintain 50 PSI of air to the tire chuck. DO NOT EXCEED 50 PSI. 5. It will take 10 to 30 minutes for oil to appear at the other end. then your done. Have rags to catch the oil if your in a sensitive area. I suggest safety glasses just in case somethings blows apart, but I have never had a problem. My save rate on cables is about 75%. I did all my cables every 2 years as PM but I was not on salt water. Last edited by OLD HOUSEBOATER; 07-22-2012 at 10:13 PM. this is such good advice. we did it on 3 boats with fantastic results. now we do it every fall when winterizing. I didn't know my lower shift cable was sticky until I did this to the cable. Now it is smooth and you can shift with just a fingertip. Still gotta do the ski boat this summer. Have you ever tryed this on steering cables? If you are considering purchase of a boat with one of these installations you should obtain the manual to furnish to your service person prior to purchase of the boat.